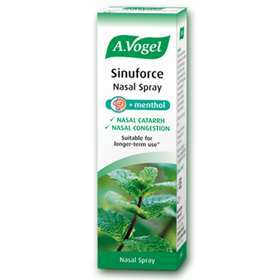 A.Vogel Sinuforce nasal spray with menthol provides rapid relief from a blocked or congested nose. It reduces swelling of the nasal mucous membrane, but leaves the natural protective function intact. The 100% natural ingredients soothe your nasal mucous membrane. If required, the nasal spray can be used over a prolonged period of up to 30 days. Sinuforce Nasal Spray with menthol also contains peppermint oil and Eucalyptus Oil to ease breathing. Moreover, the chamomile oil has a soothing effect on your nose while the unique bottle makes preservatives unnecessary. Spray once or twice into each nostril 3 to 5 times daily. Shake before use and remove cap. Keep bottle upright when spraying. Do not exceed the stated dose. May be used without interruption for a longer period, up to a maximum of 30 days. Sinuforce Nasal Spray can be used as directed during pregnancy or when breast feeding. Do not use in the case of: Hypersensitivity to any of the ingredients. In general, you can use this product together with other products. In case of doubt, it is advisable to consult your doctor or pharmacist. At the recommended dose, the product is generally tolerated. Ingredients: Physiological saline solution (purified water, sodium chloride (NaCl), disodium hydrogen phosphate-12H2O, sodium dihydrogen phosphate-2H2O); sorbitol; PEG-40 hydroginated caster oil; (Eucalyptus globulus); peppermint oil (Mentha piperita); Chamomile oil (Chamomilla recutita).